Nurses are the best sources for learning what really happens in hospitals and medical offices. Doctors rush from patient to patient, but nurses are the ones who spend time with them. They also see what happens behind the scenes. Alexandra Robbins is a writer who spent 4 years interviewing and following nurses for her book. In her article for Politico, Alexandra shares some of the healthcare secrets she learned from these nurses. Some of these tips could save your older adult’s life. We’ve highlighted the top 4 insider tips that are most important for seniors. Use these to make sure your older adult gets the best care possible. This is the most important insight that Alexandra learned. In teaching hospitals, July is when medical students become interns, interns become residents, and existing residents move up a level. Why is that so important? On day one, an intern is given the same responsibilities as a first year resident. But they’ve had no hands-on experience and many won’t even ask for help. That leads to mistakes — sometimes fatal ones. Each July, U.S. death rates in teaching hospitals increase by 8 – 34%. That’s a total of 1,500 to 2,750 more deaths. UC San Diego researchers found that fatal medication errors “spike by 10 percent” only in July. So what can you do if your older adult has to be hospitalized in July, especially if they’re having a complex procedure? Do your best to avoid teaching hospitals. If you can’t avoid it, be extra vigilant about everything that’s happening to your older adult. Nurses are behind the scenes. They watch doctors work and see firsthand what happens to the patients. If you’re trying to choose a doctor for a procedure, consider speaking privately with a nurse to ask who they would choose to operate on someone they love. In doctor’s offices, you might be speaking with someone who is impersonating a nurse and giving you the wrong information. Medical assistants will often pick up the phone and say “this is the nurse” and give advice. But because they lack proper training, they may give incorrect answers. This is dangerous because if you’re calling to ask a question about your older adult’s care or medication, that incorrect answer could lead to serious problems. Medical assistants attend a 1-2 year certificate training program, might not have a college degree, and don’t have a license. Nurses have a 2-4 year college degree and a Registered Nursing license. The next time you call the doctor’s office about an important question, make sure you’re speaking to a licensed nurse and not to a medical assistant. Some nurses said that doctors bully people into unnecessary tests and procedures. Because our healthcare system pays fees for each high-cost treatment and procedure, some doctors and hospitals might push more of those treatments. To help make their case, doctors sometimes don’t tell patients how much rehab it will really take to successfully recover from a surgery. They don’t say that many patients won’t ever get back to their pre-surgery functioning and that some won’t even make it out of the hospital. 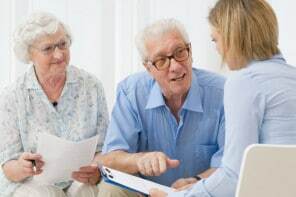 Don’t be afraid to ask plenty of questions about your older adult’s recovery potential before making a decision about an invasive test or procedure. After all, the last thing anybody wants is for your older adult’s quality of life to be worse after a procedure that wasn’t strictly necessary. The world of medicine is confusing and often scary. Experienced nurses say that you shouldn’t blindly trust the medical system to do the right thing for your older adult. Don’t be afraid to ask questions until you absolutely understand what’s happening and agree with your older adult’s treatment plan. Shop around to find the hospitals and doctors with the best reputation. After all, being a strong advocate and thoroughly understanding the available options for your older adult could truly save their life. What is a DNR and Why Would Seniors Need One? This article wasn’t sponsored, but does contain affiliate links. We never link to products or services for the sole purpose of making a commission. Recommendations are based on our honest opinions. For more information, see How We Make Money.